in Subpart B of Part 15 of FCC Rules. regulations in each sales region of the Network Scanner. Opera Software ASA in Norway or other countries. Copyright (c) 1991-2, RSA Data Security, Inc. Created 1991.
this software or this function. all material mentioning or referencing the derived work. 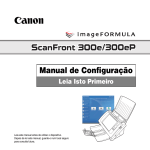 permission of CANON ELECTRONICS INC. 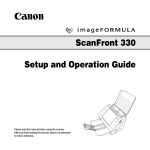 Thank you for purchasing the Canon ScanFront 300e/300eP network scanner. many functions. After reading this manual, store it in a safe place for future reference. * The destinations to which the scanned images can be sent will vary depending on the license provided with your scanner model. thoroughly before using the device. Installation Guide (electronic manual) and the Help. CD-ROM and requires Adobe Reader to open. instructions that should be observed for safety. correctly, and avoid damage to the device. 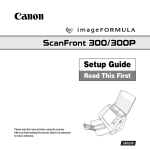 Follow the procedures below to set up the ScanFront 300e/300eP. Learn the names and functions of the parts of this device. Confirm that all of the supplied accessories are included. connect the AC adapter and network cable. [Power off] on the touch panel to turn it OFF. and eCopy ShareScan Administration Console. Administration Console to establish a connection. Prepare the device for document loading. This section describes how to clear paper jams. To ensure the safe operation of this device, be sure to read the safety warnings and precautions described below. current requirements of the device. it in any way, as this is extremely dangerous. an accident, such as a fire or electrical shock. remove it from the outlet. disconnected easily in an emergency. ● Use only the AC adapter provided with this device. or service representative for further information. device unit is approximately 7.9 lbs (3.6 kg). excessive force applied to them during movement. excessively bend the power cord. may tip over and fall, resulting in personal injury. wiring, resulting in a fire or electric shock. to disconnect it in an emergency. device for a long period of time, such as overnight. time, such as during consecutive holidays. cord to stop the device. of the fingerprint sensor regulary. dry cloth to wipe dirt off the surface. to ensure that the registered data is deleted. retailer who sold you the device. 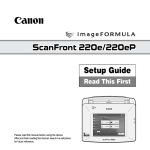 The names and functions of the parts of the ScanFront 300e/300eP are shown below. 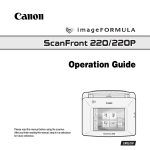 Touch this screen to operate the ScanFront. Adjust these to match the width of the document. memory device, USB keyboard, or USB mouse. Use this to turn the power ON. Open this to prevent scanned documents from slipping off. Use this lever to change the feed method for documents. Connect the plug of the supplied AC adapter. be connected to prevent theft. missing or damaged, contact your local authorized Canon dealer. * Make sure to use only the supplied AC adapter and power cord. Remove all of the packing materials protecting the device, and attach the feed roller. 4. Gently remove the packing materials. document eject tray when you open the panel unit. 5. Remove the orange tape securing the roller covers. 6. Open the roller cover for the feed roller. insert it into the hole in the feed roller. of the device, and place the feed roller into position. 13. Gently close the document eject tray. Before setting up the device, you need to connect the AC adapter and network cable. Follow the procedure shown below to connect the AC adapter. Make sure to use only the AC adapter and power cord included with the device. varies by country and region. a Connect the power cord and AC adapter. b Insert the plug of the AC adapter into the power connector. c Connect the power cord to the wall outlet. Insert the network cable connector (RJ-45) into the LAN port. Use the power switch to turn the device ON and OFF. indicator lights, and the Startup Menu screen appears. the power OFF before turning it ON again. screen to appear after the power switch is turned on. off. You can touch the panel to restore the display. Administration Console on your computer are as follows. 100 Base-TX network interface card is required. ShareScan 5.0 Installation Guide (electronic manual). necessary software) on the computer. on a computer that has a static IP address assigned. provided by your dealer at the time of purchase. Administration Console to configure the device. purchasing the scanner, and proceed to the next screen. instructions to restart the computer. the taskbar when the application is installed correctly. Administration Console Service Pack 4.
procedure to activate the license. The Activate License Wizard appears. database server appear on screen. selection screen, and then click [Next]. 6. Click [Finish] to close the Activate License Wizard. additional device will be required. 2. Set the administrator password. The Startup Menu for the device appears. at the top right of the Startup Menu. the [Confirm Password] box to confirm. 3. Configure network settings for the device. optional. For details, contact your network administrator. When you finish configuring the settings, press [Save]. 4. Press [Restart] to restart the device. After the device restarts, the following screen appears. appear for the device on the network. Enter a unique IP address to assign the device. 6. Specify the search conditions. Specify the search conditions with the following settings. Specify an IP address range. The device search screen appears. 7. Start the device search. If you set [Discovery] to [SNMP], click [Refresh]. for the corresponding list box. the search range appears. Click the [Yes] button. 10. Click the [Register] button. The screen for specifying the device name appears. 11. Specify the device name. • To use the current device name, enable [Existing name]. 12. Click the [OK] button. on the LCD of the added device. The device registration screen appears. 9. Configure the device registration settings. Enter the password specified on the ScanFront. settings of eCopy ShareScan to suit your requirements. For details, please refer to the eCopy ShareScan 5.0 Installation Guide (electronic manual) or the Help. 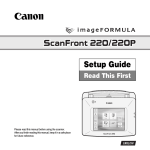 The ScanFront can scan documents in a range of sizes from business cards to LGL. It is possible to feed documents of the following sizes and thicknesses depending on the feeding method used. cause the device to jam. appear on images, or dirty other documents. stripes to appear in images, or dirty other documents. the feed selection lever to the appropriate position for the desired feed method (Page Separation ON or OFF) for the document. Prepare the trays in accordance with the type of document. 1. Open the document feed tray a. 2. Open the document eject tray b.
likely to fall out of the tray. particularly thin documents, remove the eject tray. a and pull out b.
the tray into the holes on the device. After connecting the tray, make sure that it is attached securely. time without separating the pages. When placing documents into the device, place them face down into the tray with the top edge of the document at the bottom of tray. Follow the procedure below to place a document. edge of the first page is the lowest. mid-feed) from the scanner as follows. stopped mid-feed) and press [OK]. is enabled in the Scanning Settings for the device. sheets you place in the document feed tray to about 10.
retard roller), and document holding guides. seems the easiest to remove it. 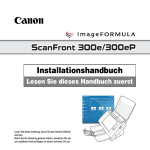 The ScanFront 300eP is equipped with a fingerprint sensor for registering fingerprints and authenticating users. The fingerprint sensor is a precision component. Be careful when handling this sensor. of the fingerprint sensor regularly. press the finger on the fingerprint sensor. of washing your hands or applying hand cream. accordance with the message that appears. 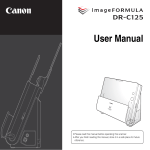 This section describes the basic procedure for scanning documents using the device. computers and devices on a network. This section describes the procedure for sending scanned data to another computer. Guide (electronic manual) or the Help. 2. Place a document in the device. 3. Press a task button in the Home screen. The scan settings appear at the left in the Home screen. configured on the ShareScan Administration Console PC. configuration for that item and change it as necessary. see “Preview Screen” on p. 37.
sent, a screen for selecting the next operation appears. keyboard, see “On-Screen Keyboard” on p. 37. 6. Select the next operation. Press one of the following buttons. New Document: Begin scanning a new document. Images of scanned data appear in the Preview screen. Display the next page of the scanned images. Display the last page of the scanned images. Zoom in or out on the scanned images. for scanned data, for example. previously displayed on the Preview screen. Delete the page currently displayed. Rotate the page to the left or right. Change the file format for the scanned images. Display the first page of the scanned images. Display the previous page of the scanned images. held down until this button is pressed again. using the scanner or ShareScan to scan. • Fingerprint authentication may take several seconds. automatic logout function is disabled. Console and not by users from the device.